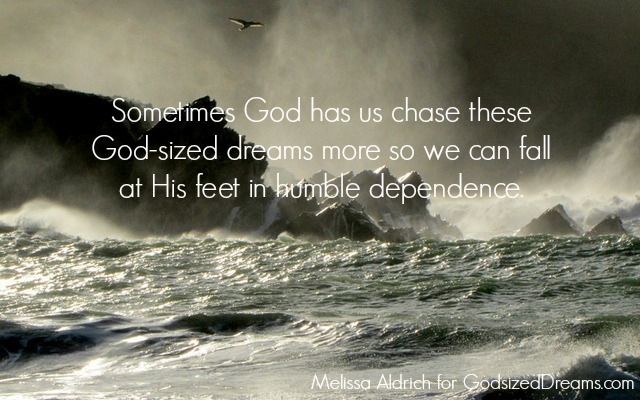 Today we welcome the words of God-sized Dreamer, Melissa Aldrich. Melissa is a wife, mama, a gifted and passionate photographer and writer, and we know she will be such an encouragement to you today! I just want to give up. But God won’t let me. It’s that season of each month when I just feel like a failure…no bookings. No inquiries. I change things around. I work on my SEO. I write posts for my target market. I study marketing. Still…the inquiries are just fading away. Every time, I give this photography business to God; every time, I whisper that I don’t want it if it’s not what He has for me; and every time, He makes it clear to me that He wants me to pursue it. One time I win a newborn prop bonnet. Another time I’m invited to join the God-Sized Dreams Team. And then there was that studio lighting class valued at $299 that I won last fall. What I’m learning is that sometimes God has us chase these God-sized dreams more so we can fall at His feet in humble dependence. It’s not about success. It’s not about booking clients or making that extra income we could use to bless others. It’s not about booking a single Mother’s Day mini session to benefit a charity. You see, God wants all of us to pursue that crazy dream He gives us. He wants us to step outside of our comfort zones so we can freefall into His grace. He wants to use our dreams and our talents to grow us. Stepping out boldly to pursue your dreams…oh, it’s going to rock you to the core. You’ll shed tears with your spouse and dearest friends. The results will never be what you expected, unless you expected to shed pride and embrace humility. Tell me friends: what did you expect “success” to look like? What big lessons have you learned along the way? Melissa Aldrich rarely has it all together, but she knows the One who does. She encourages others (but mostly herself) to see the mess in daily life as real, beautiful grace. Melissa is a wife, mother, sometimes writer, dreamer, and Greenville SC Newborn Photographer. Catch up with her on Facebook. Beautiful encouragement today Melissa! So many times I just want to give up, but God is always there with a gentle whisper that we are not done yet and to hang on. I find those gentle whispers both infuriating and fully reassuring. Just what I needed. I’m so frustrated with how long everything takes. I want those obstacles gone a couple of years ago. I know I’m a work in progress…but I’m just tired of it all! Cheery, huh? I think when we understand that the dream might actually be more about our personal growth in relationship with Him, then we’re released to really live in the mess and trust him. Cheery? Nope. Hard? Oh, yeah. Worth it… I promise. You know what I need when I need it, dear friend! I face the opposite problem. Yes, there are so many days that I want to give up my dream, but I can’t. And I can’t tell my husband of my frustration because he would encourage me to give up. Thank you for your encouragement to keep at it and to give it all to Jesus. Oh, sweet Olivia, just keep leaning in and listening hard. God is training you up, friend. And I just know your obedience and dedication to His call will be rewarded. Keep going!! You too, Christine. Your obedience for this site… thank you. Tori, I’m glad I could encourage you just a little bit. Quitting is always easiest when we’re measuring by our own standard of success. I think that’s why we’re in humble dependence… we can’t even define success in the way that He does. Debbie, keep dreaming. Keep pursuing. Because you know, it’s really all just Him pursuing you. I love that passage in Hebrews… I love how it’s his promises that drive us and not success. Yeah, God seems to know when we really need encouragement, like a surprise win, or a call from a friend to have lunch. One thing I have learned about encouragement, we ALL need it! So I have recently started to spread encouragement around. It makes me feel like I’m not wasting my time, even when my God-sized dream is on hold or taking a nap. Encouragement is always appreciated. 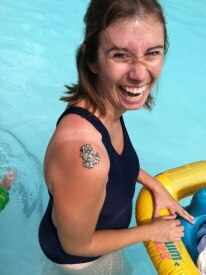 Melissa, keep working on the photography, your pictures are amazing! You definitely have talent. I looked at your webpage and I LOVE the baby picture with her head in both hands. Gorgeous! Hey, just thinking, have you tried posting a baby pic on twitter with a link to your webpage? You can use #s to get the attention of people with similar needs or interests. Like #sweet babies or #baby pictures. You can search the #s on twitter to find good ones to use. It might generate some contacts. Just an idea to consider. God is blessing you and others with your photography. I am like a Twitter egg with just a few cracks in the shell. I know how to use hashtags and such… but I don’t enjoy Twitter at all. I almost passed out this morning at 8am when I had 7 twitter notifications in my inbox until I remember that I had a guest post here! I play mostly on Pinterest and Facebook and of course the playground with my three under 4 :-p There’s just not enough hours in the day to keep doing the things I need to do and play on every social media network. I really feel I’m being called to a season of waiting. Long waiting without striving or forcing His hand toward my version of “success”. So I’ll wait on Him to move. Nothing wrong with waiting, Melissa. We can grow and settle and ferment some ideas. I hear you about all the social media. There are only so many hours of the day to spend away from family time. I really Loved seeing your photos on your webpage. They really made me smile. Oh, girl . . . ! You know it. I do know it. So your Vox… well, it was already something fermenting. I wrote this piece about a month ago 😉 Thank you for being a well-loved guide on my journey. Yes, I love that line that Amy quoted too. Freefall into His grace…now that takes guts! Beautiful true words here today Melissa. Thank you!! Thank you for having me over again! God sure does call us to do stuff and it is very uncomfortable and sometimes we are like, “Me? Are you sure you have the right person?” And I have to trust Him. I was hiding. I didn’t want to be online because of sexual abuse when I was little. Then satan kept on working on me until I fully believed in my 20s that I was absolutely worth nothing. That little old devil was very wrong. Now God’s got me writing online and is moving our family to Alaska to open and care for a homeless teen place. WE don’t know how to do this but HE does and we are following and trusting as He opens doors. Prayers always welcome here. What Will Your Dream Legacy Be?